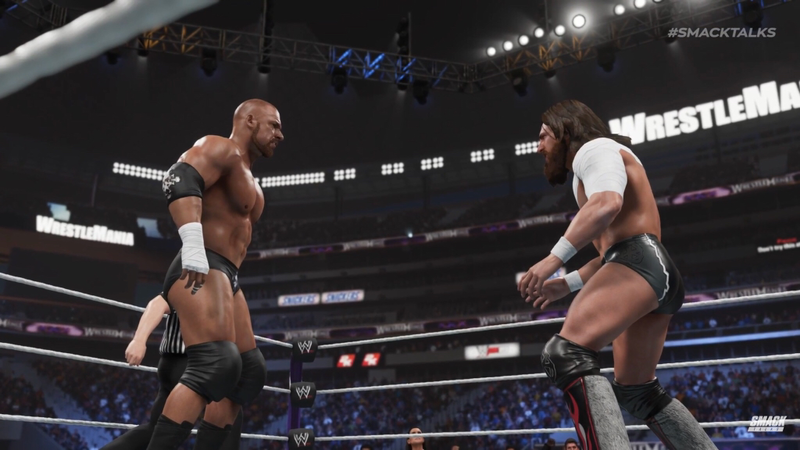 2K announced the return of the 2K Showcase, a story-driven campaign mode honoring Daniel Bryan’s legendary career. Relive the most epic moments, the highlights and the challenges, from Daniel Bryan’s career that have made him the WWE Superstar he is today. The “Return of Daniel Bryan” Showcase features vignettes with historic WWE footage and Daniel Bryan’s own words that give context and backstory to the subsequent matches that gamers will play through, enabling players to truly feel the adversity that Daniel Bryan has faced each step of his WWE career. Fight for his dream by competing in 11 objective-based, legendary matches, and one additional “surprise” match, playing as variations of Daniel Bryan to unlock historic arenas, Superstars, attires and championships. WHAT IS A 2K SHOWCASE? Achieving objectives often triggers mid-match cinematic cutscenes that allow the user to recreate historic moments on their way to victory. Completing objectives also unlocks special arenas, Superstars, attires and championship belts. The goal of finishing a Showcase is to complete as many objectives as possible to earn all unlockable content, and of course, relive some awesome WWE history along the way! WHAT PROMPTED THE 2K SHOWCASE RETURN IN THE WWE2K FRANCHISE? 2k has received a lot of requests asking us to bring back the mode. Internally, the team also wanted to bring 2K Showcase back because it adds a different gameplay dimension, as players are attempting to recreate historic moments. It’s a great way for players to learn about different WWE Superstars and experience matches they may not have witnessed when they originally occurred on WWE programming. Daniel Bryan is one of themost popular WWE Superstars in the last decade, with nearly universalsupport from the WWE Universe. His story resonates with everyone, as he worked incredibly hard to get to the top of his craft – only to deal with setbacks that seemingly would keep him from fulfilling his dreams. He persevered, fought for what he wanted and is now back doing what he was meant to do. His story is both relatable and inspiring for anyone trying to achieve their goals in life. More specifically, Daniel Bryan has four new entrances and six new victory scenes. Team Daniel with Kane as part of “Team Hell No” for a special surprise. For additional details, check out the blog post. WWE 2K19 is scheduled to release on October 9, but fans can get it 4 days earlier, on October 5, by pre-ordering the Digital Deluxe Edition or Collector’s Edition. - More than likely old Smackdown arena with the fist. - Old but young Cena. Same as Kurt and Taker from 2K18. Fix this ****. - More than likely no CM Punk or Nexus which makes this showcase very meh. Doesnt excite too much, but does make me go from no buy to intrigued to what else they are going to do. Meh, I like Daniel Bryan but not enough to have an entire mode centered around him. Have they released any info at all about gameplay improvements, or anything that would remotely justify the enormous cost of the game with all the DLC? I'm honestly pretty tired of this series, and the general complacency and greed 2k has shown as a developer for pretty much this entire generation of consoles. Thank the heavens that Fire Pro is coming to PS4, gives me a wonderful alternative to this $100 roster update. rinse and repeat, i have wwe 13,14 &18 for not only my story mode fix but universe as well, all those rings and characters involved with 2k19 can be achieved in either o those games listed. no innovative enough for me to buy this year. Yeah without Punk and the Nexus you are missing his entire beginnings in WWE. Not to be Mr. Cynical, but to me this is a regression. When they first got rid of the showcase modes they said they did it to focus on perfecting the other modes and features. This tells me they don't have much else to market because they didn't improve much. Hopefully I'm wrong though. Showcase Mode does little for me. I'd prefer some kind of original story. Haven't had one of those in a long time. This is awesome can't wait. I like the Showcase modes but I’d rather a really well thought out and branching story mode like No Mercy had. Like what if they had the consequences of choices and W/L like an Until Dawn inside a WWE story. That would be worth playing. As it stands now, until the game becomes more fun to actually play, there’s almost no mode they can add that will get me to buy the game.